In case the forming of DNA in new cells is prevented, which can be caused by different reasons, impacts on the growth of the progenitor cells of the erythrocytes are possible. 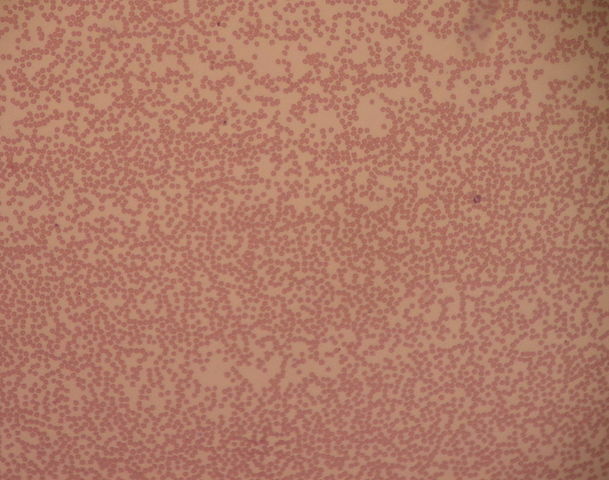 The so-called erythroblasts show typical morphological changes, which are called megaloblastic. In the following section, the two first-mentioned causal diseases are presented in more detail. The vitamin B12 deficiency is a macrocytic-hyperchromatic, megaloblastic anemia with a lower level of vitamin B12. The most common cause is a disruption in the resorption of the vitamin. In case the disrupted resorption is caused by a type-A-gastritis with a resulting intrinsic factor-deficiency, the disease is called pernicious anemia. A disrupted resorption in the area of the ileum after resection, Crohn’s disease or exocrine pancreatic insufficiency can cause a megaloblastic vitamin B12-deficiency-anemia, but they aren’t classified as pernicious anemia. The evidence of autoimmunity alone justifies the finding of a pernicious anemia. The daily intake of vitamin B12, which is also known as Cobalamin, is only around 2 – 3 µg. However, a disruption of the incorporation, resorption, synthesis or storage of the vitamin can lead to serious symptoms. This mainly occurs in areas of the body where the vitamin is essential, especially in the bone marrow. In case there is an insufficient amount of vitamin, this can have negative effects on the erythropoiesis. As a coenzyme of the metabolism of nucleic acids and lipids, it plays an important role in the production of active folate acid. If production is disrupted due to a Cobalamin deficiency, the correct forming of the DNA is no longer possible, which leads to an anemia in the form characterized above. As the human being has to take in vitamin B12 orally and the said vitamin is mainly found in animal products like meat, fish, milk and eggs, a vegetarian lifestyle can lead to a vitamin B12 deficiency-anemia; however, not every vegetarian necessarily has to develop an anemia. No other vitamin can be stored better in the liver over longer periods than vitamin B12, so that a supply can last for months, or even years. Alimentary states of deficiency are very rarely the causes for a vitamin B12 deficiency-anemia. One of the more common causes of a vitamin B12 deficiency is the anacidity in the milieu of the stomach. In case the milieu of the stomach is not balanced and the release and binding of the vitamin to the proteins of transportation is disrupted, a disruption of the resorption can occur, which, if chronically, can lead to an anemia. The transport mechanism can also be disrupted in other places. T-cells can destroy parietal cells (parietal cells of the stomach), triggered by an autoimmune reaction. The parietal cells produce the intrinsic factor, which is necessary for the transportation of vitamin B12. As the intrinsic factor is destroyed alongside with the destruction of the parietal cells and the forming of antibodies, the binding of vitamin B12 to glycoprotein does either not take place at all or only to a lesser extent. Transportation and resorption of the vitamin are severely disrupted. Besides the typical symptoms of anemia like lethargy, pale skin and pale mucosa, a patient with vitamin B12 deficiency may also exhibit a sub-jaundice (higher level of bilirubin in the serum), which is the result of the disrupted turnover of the erythrocytes in the bone marrow. Since all cells are affected by the disruption, neutropenia and thrombocytopenia can occur at an advanced stage, resulting in thrombocytopenic purpura (hemorrhagic diathesis) and an overall weakening of the immune system. In comparison to other anemia, the vitamin B12 deficiency can also cause neurological disorders, which can vary from an isolated peripheral neuropathy to a subacute combined degeneration of the spinal cord. Clinical symptoms are the disruption of memory, loss of concentration and sensitivity, paraesthesia and reduced reflexes; even muscular paralysis is possible. The reason for the occurrence of these diseases is a prolonged vitamin B12 deficiency which leads to a de-marrowing of the myelin sheath, especially in the area of the dorsal and lateral column system of the spinal cord (demyelination). In most cases (90%), a lower level of vitamin B12 in the serum is proof enough. However, this value is not 100% reliable because it can be falsified by proliferative diseases of the bone marrow, or by diseases of the liver. In addition, there are also patients who already exhibit symptoms of anemia in the lower normal range. In these cases, determining the serum concentration in the methyl malonic acid and the homocysteine acid should be considered, because both values increase in case of a vitamin B12-deficiency-anemia. As in most cases, a blood count is the first hint for a possible anemia, and normally precedes the measurement of the vitamin B12 level, a lower value of hemoglobin alone, in combination with macrocytosis and hyperchromasia, it should hint towards a diagnosis of a vitamin B 12-deficiency-anemia. In comparison to an iron deficiency anemia, all of the cells are affected by a vitamin B12 deficiency and therefore lower values of leucocytes, as well as thrombocytes, can be found (pancytopenia). 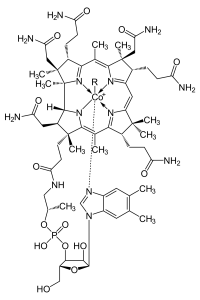 If there is proof of vitamin B12 deficiency, the cause has to be found. To distinguish between a disruption of absorption and an intrinsic-factor-deficiency, the Schilling-test, with radioactively marked vitamin B12, can be conducted. In the case of a suspected pernicious anemia, a proof of antibodies for the intrinsic-factor, as well as for the parietal cells of the stomach, should be conducted. The most common cause for a vitamin B12 deficiency can be found in the stomach; that is why a gastroscopy is indicated for every patient with a vitamin B12 deficiency. With this procedure, a stomach carcinoma, as well as an atrophic gastritis, can either be excluded or proven. The therapy depends on the underlying disease. Additionally, vitamin B12 is substituted. 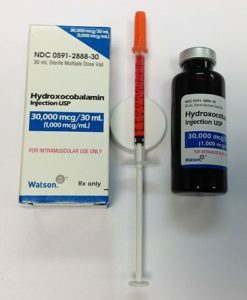 Normally, a high dose of hydroxic cobalamin (1000 µg) is given parenteral once a week. After the values have reached a normal level, a lifelong therapy with 1000 µg, every six months, is indicated. If the underlying disease is identified and treated and the substitution of vitamin B12 is administered in the right way, the anemia declines within a couple of days. The neurological symptoms, caused by a vitamin B12 deficiency, can, when untreated, lead to lasting neurological damage. Because of the atrophic and aplastic changes of the mucosa, the risk for a stomach carcinoma, or other carcinoid diseases, is higher for patients with a pernicious anemia. Note: The most common cause of a vitamin B12 deficiency is a type-A-gastritis. Besides the typical symptoms of anemia, the patients also show signs of neurological disruptions. Diagnostically, the blood count, the measurement of the level of vitamin B12, as well as the determination of the antibodies, is path-breaking. Alongside treating the underlying disease, a substitution with vitamin B12 is necessary. Like vitamin B12-deficiency-anemia, the folate deficiency is a megaloblastic anemia. The most common cause is nutrition with an insufficient folate acid level. From a biochemical point of view, the folate acid is a term for a whole group of so-called derivate of pteridine. These are produced by plants, as well as microorganisms. Vegetables, salads, fruits, milk, wholegrain products and offal are a good source of folate acid. That is why before the pharmacological substitution, the substitution with cattle liver was the first choice. As the recommended daily intake is around 400 µg and, in the case of bad nutrition with too less folate acid, the body’s reserves of 5 mg folate acid are consumed quite quickly; symptoms of folate deficiency can occur within a couple of weeks. A folate deficiency leads to the typical symptoms of anemia. Atrophy of the mucosa in the area of the larynx (dysphagia) or the gastrointestinal tract (meteorism, diarrhea) are signs for a vitamin B12-deficiency-anemia, as well as a folate deficiency. However, the folate acid does not play a role in the metabolism of the lipids and, therefore, does not cause neuropathies. Because the blood count and the findings of the bone marrow also correspond to vitamin B12-deficiency (macrocytosis, hyperchromasia), further testing and determination of other values are important to distinguish between the two megaloblastic anemia; therefore, it is important to measure the level of vitamin B12 to exclude an additional vitamin B12-deficiency-anemia. Furthermore, the level of folate acid can be determined. This, however, only has little meaning as it can be influenced very easily. Just one meal with folate acid can bring the level of folate acid back to normal. A more reliable parameter is the concentration of folate acid in the erythrocytes. Normally, treatment of the actual disease (alcohol abuse, anorexia nervosa, etc.) is enough. However, depending on the severity of the disease, this is not always easy and, therefore, difficult to implement. 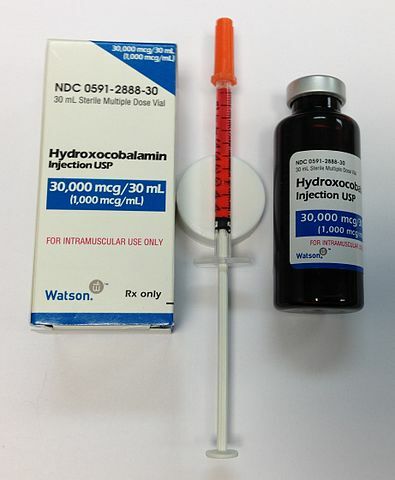 In such cases, it is important that the dose for substitution is high. To eliminate the causes and for prophylactic reasons, a daily intake of 5 mg of folate acid is recommended to be applied orally. In case a folate deficiency stays untreated over a longer period of time, accelerated development of arteriosclerosis can be a consequence. The result of arteriosclerosis can be, at the worst, myocardial or brain infarction. In the case of folate acid insufficiency during pregnancy, neural tube defects can be the result for the child during the embryonic phase. Also, osteoporosis is suspected to worsen when accompanied by a folate deficiency. Note: Without checking the neurological state through anamnesis and clinical examination, folate deficiency can be confused with a vitamin B12-deficiency-anemia because of the similarity in the blood count and the clinic. That is why it is important to know that a folate deficiency alone does not lead to neurological symptoms. 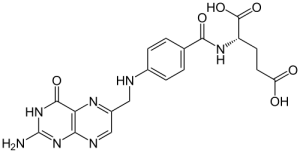 Inability to convert orotic acid to UMP (de novo pyrimidone synthesis pathway) because of UMP-synthese defect. Failure to thrive in children, developmental delay and refractory to B12 + folate treatment. No hyperammonemia (vs. ornithine transcarbamylase deficiency → ↑ orotic acid with hyperammonemia. Rapid-anemia within the first year due to intrinsic erythroid progenitor cells, ↑ HbF (↓ total Hb) short stature, craniofacial anomalies, upper extremity malformations (triphalangeal). Davis, L. J., & Brown, A. (1953). The megaloblastic anaemias. Springfield, IL: C. Thomas. Hoffbrand, A. V. (1976). Megaloblastic anaemia. London: W.B. Saunders. Magnus, E. M. (1975). Folate studies: Folate and vitamin B12 values in relation to bone marrow pattern. Rutter, A. (2012). Anemia (decrease in number of red blood cells). New Delhi: World Technologies. Sippe, G. R. (1947). Nutritional macrocytic anaemia. London: Crown Agents for the Colonies.